The author is literature student and an avid reader. She blogs at Random Ragas. She believes in spreading positive vibes. A fan of Robin Sharma, you can find her blog filled with quotes and short stories. The eBook is a collection of the blog posts written during the April A-Z blogging challenge. One could call the book the A-Z of motivation. The author believes that in a world filled with negativity we have forgotten that we have a choice. A choice to remain positive and see the bright side of things. Personally I believe it is difficult to see the bright side in everything no matter how hard we try. She redefines every letter that we learnt with a positive word. Stay hooked to the book to discover what she must have done when she reached the last few letters. The book opens with a powerful word, appreciation. I believe appreciation keeps relationships healthy. The author narrates her experience and gives a personal touch in most of the chapters. The language is simple and the grammar good. The chapters are small and crisp. One would not loose interest at any point of time, given the nature of the book. The content is good and you will develop a connection with the author and the book at the end of the book. It is twenty minute read , but take your time. Let the words and deep quotes sink in. The book compels you to get into introspection mode. If you are feeling low and looking for some motivation, just pick up this book I say. The author could have elaborated in some of the chapters, otherwise the book is a good book for a Monday morning on your way to office or college. 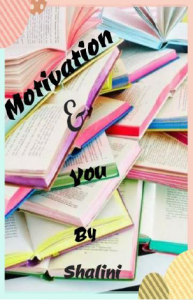 You can download a copy of the eBook here- Motivation & You . Connecting the post to Day 5 of#Halfmarathon by Blogchatter.